I read a lot of news from the 20 min online website using the 20 min online .ch app for iOS. Every now and then, people start commenting the articles (and leave behind a lot of silly comments). My goal was to get the URL where this data (the comments) is loaded from (for some unexplainable reasons :-)). As the website offers the articles as RSS feeds, the assumption was that the app will load the comments also via RSS feed. So how to eavesdrop the network traffic between the iPhone and the Internet? The iPhone has four communication interfaces: GSM, WLAN, Bluetooth and USB (neglecting all non-networking interfaces like display, speaker, etc.). Now there must be way to eavesdrop on one of those. The WLAN was the obvious choice. Either your local router supports very detailed logging or you need to set up your computer as router and inspect the packets transferred with wireshark. So here I write about how to setup your computer as router. 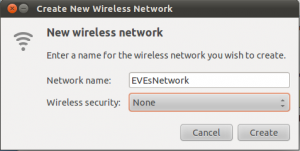 In a recent version of Ubuntu, you have the ability to create a wireless network managed by your computer out of the box. 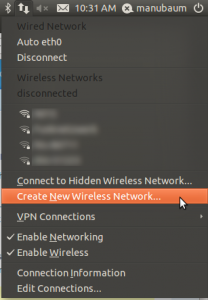 Then inside the the Wi-Fi menu, switch on Wi-Fi and select the newly created WLAN (yes, we are still in airplane-mode). This forces the iPhone to route all packets through our WLAN network / we assure no data is sent using GSM. Click on Capture ->; Interfaces and chose the WLAN device that communicates with the iPhone (most likely wlan0). Now, you capture all network traffic between the iPhone and the Internet. In this example, I analyzed the Facebook app for iOS. The question is, where the image data is fetched from. As a HTTP request will do a at least an SYN, SYN-ACK, ACK for connection establishment (and further stuff) you best set the filter in Wireshark to “HTTP”. Then you only see the actual GET requests from the client and the responses from the server. In case SSL is used, you wont see any packets when filtering for HTTP. This means you cannot inspect any packet when the app uses SSL (meaning https instead of http), which is the very purpose of this encryption protocol. Slow website? Have you tried turning on file compression? If not, this tweak can speed up your website in an instant. What is it doing? The first line is the most important one. It activates the compression of the data before it is returned by the webserver. Then 2-5 are pretty much neglectable, as they deal with legacy Netscpae browsers and apache bugs. Number 6 is important, as you do not want to recompress already compressed data. The last configuration (7) requires the mod_headers module and deals with proxy caching. captcha protect your website using Apache’s mod_rewrite to expel Google, Facebook and Co.
MACHINES: search engines, facebook (when a link is posted, the content of the link is fetched by Facebook), etc. You want that your FRIENDS have full access to your website, whereas MACHINES should not. The SOMEONEs you don’t particularly care and therefore allowing access as well. For any defined part of your website you’re asked to enter a Captcha in order to prevent MACHINES to access this data. Your FRIENDS clicking on a hyperlink in facebook should not be asked to enter a captcha to avoid annoyances. SOMEONE else has to enter the Captcha to distinguish them to MACHINES. When the request uri contains somePrivateStuff or noMachinesShouldSeeThat (the folders you do not want to be accessible by google, fb, etc. ), there is no cookie named noauth (actually the string of the key-value pairs of cookies do not match “noauth”), and the request is not pointing to yourwebsite.com/howdy, the request is forwarded to yourwebsite.com/howdy?target=/somePrivateStuff, i.e. presenting a captcha challenge to keep out MACHINES. Take a look at the /howdy/index.php. Depending whether we have already set the “noauth=IF-ONLY-MACHINES-KNEW-THIS” cookie (note that the cookie is called noauth to stress the point that it is actually no real authentication and provides no real security! ), the answered captcha challenge and the referrer of the request, the cookie might be set and the user might be forwarded to the requested ressource. Now, your website is at least safe from machines as they cannot pass the captcha entry, without annoying your friends as they will not notice this simple way of protecting your website. Copy-paste a hyperlink pointing to a protected directory on Facebook. Facebook will connect to that link to create a preview of the content. You will notice, that the Facebook server will be forwarded to /howdy ! So even though you share information, your data remains in your possession. Googling the protected page yields the expected result. The crawler was presented the captcha. Yet, clicking on the link is forwarding you to the correct resource. Pasting a link to my website on Facebook has the same effect, yet every friend following the link will be presented the information immediately. I just figured out that recaptcha can be found at http://www.google.com/recaptcha. Google could actually bypass a captcha easily, as they obviously “know” all the captcha challenges. There is no evidence, that this kind of information-protection works in all kind of conditions. See Disclaimer.